Vibration testing and shock loads identified in the AAR Standard S-5702 for locomotive mounted components. Life cycle testing under flow conditions simulating one fueling event for each day for a period of 10 years. Nozzle and poppet testing as per SAE AS5877 Detailed Specification for Aircraft Pressure Refueling Nozzle. This specification includes extreme cold (-37°C) operation, proof pressure, endurance limits, and burst pressure. Wide range of pressure and flow testing simulating the diverse fueling operations in the railroad industry. The system is capable of operating with nozzle pressures from 5 to 100 psi. All production units are tested to 180 psi proof pressure and for functionaility. Extensive flow testing of the SpillX system has been conducted to determine the system’s ability to flow at higher rates in an effort to reduce dwell time of locomotive during fueling. 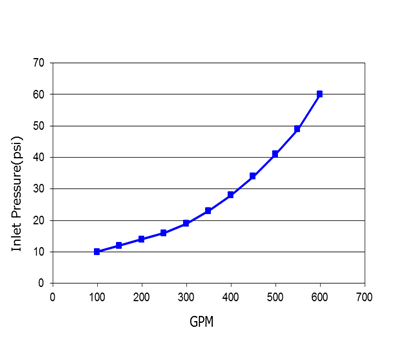 A typical flow curve for the SpillX system can be seen below, where inlet pressure is measured at the nozzle.